Today is one of my favourite days, shrove Tuesday or “Pancake Day”. For many people it marks the beginning of lent (the period leading up to feast and celebrations of Easter). During lent Christians Traditionally gave up many food stuffs and fasted. Pancakes were a way of using up all the left over ingredients which wouldn’t keep until Easter. These days people may still give something up for Easter and the tradition of Shrove Tuesday has turned into Pancake day. I really love pancakes and often make them for breakfast with some bacon and honey or syrup, its a treat breakfast which I probably have a little too often. I posted a recipe a while ago for American Breakfast which I often make. I also really like Serving the simply with lemon and sugar. This evening however I went down the savoury route. 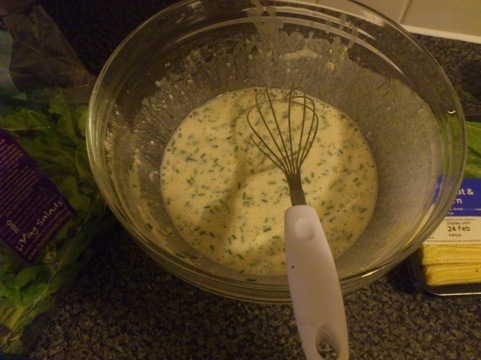 This recipe is straight out of bbc good food again, the source of much inspiration. 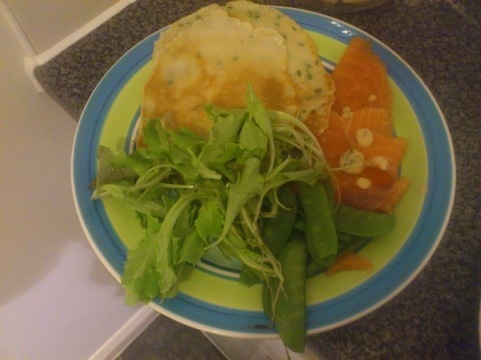 We had chive pancakes with salmon, salad and a vinegarete. Very nice! But as its very late, 11.30pm I will post the recipe for this tomorrow, along with a lovely Birthday cake I have baked for Hana. In the mean time here is a picture of the pancakes to wet the appetitie.